"We Were Wrong" is the story of a pastor who traveled halfway around the world thinking he was going to save Africa only to discover God had the opposite in mind. God would use Africa to save him from himself and his self-serving paradigm of ministry. This is a story of conversion and waking up to an expansive view of the fullness of the gospel. Reviews for "We Were Wrong"
"I was wrong. I'm sorry. These are among the most difficult words to say because they're so powerful . When my friend Keith Stewart put these words in a full-page ad in the local paper, they changed his life, his congregation, and impacted the lives of thousands and thousands of children around the world. Read this book and experience the power of those five little words." "Some pastors focus on winning converts for Jesus; others make the Kingdom ethics of Jesus their first love. Keith Stewart sees evangelism and social justice as two ways of describing the same mission. If you don’t think American Christianity has a credibility problem you need to read this book. But Pastor Stewart’s derives no joy from popping pious balloons. We Were Wrong leads the church through the awkward agony of repentance to an invigorating vision of authentic Christian discipleship." "We all need to believe that change is possible. As Christians, we place our hope in a God who actually transforms minds and hearts. We Were Wrong tells the story of an amazing and spellbinding journey by a successful evangelical Pastor in Texas and his congregation into a full commitment to God’s justice. At the same time, Rev. 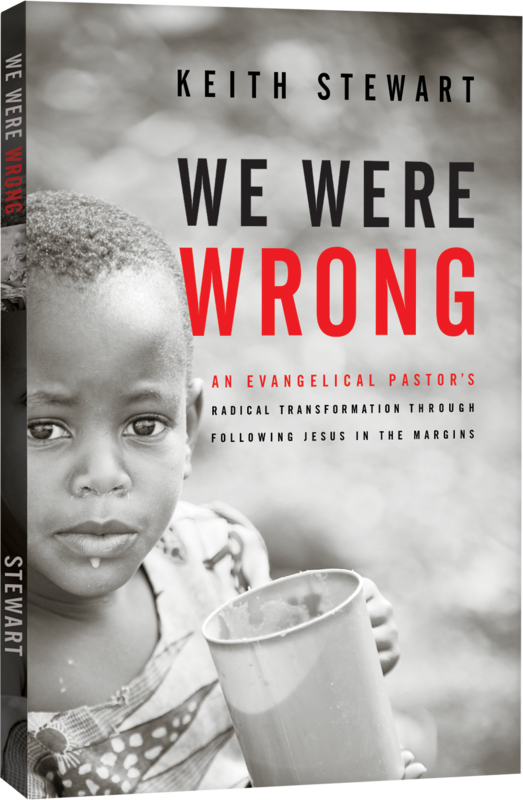 Keith Stewart communicates a vision of whole gospel discipleship that will make sense to people who may never have thought about comprehensive ministry with the poor or social justice as having any essential connection with their Christian faith. This is an important book; as a speaker and trainer in many evangelical circles, I plan to carry it around and hand it out!" "The idea that captivates me in this book is “Mutual Transformation.” Mutual transformation starts as we connect our own poverty with the people we serve. God enjoys the company of those who want to be healed in this process. Mutual transformation is that which liberates us from the cynicism of humility without obedience or of the pursuit of success over transcendent purpose. Instead of imitating the successful ones, we can enjoy the journey of mutual transformation where God guides us. Pastor Keith writes with the prophetic authority of the broken heart that clings to the only Kingdom that is worthwhile and with the stubborn desire to encourage other churches to take their social action ministries on an adventure where God moulds the hearts of all those involved. Pray as you read this book and God will guide your heart to the place He desires to heal. We don’t have any time to lose.."
"Few church communities have ever publicly admitted that they were wrong; fewer yet have worked as hard at turning things around than Keith Stewart and his church. Chronicling a journey from avoidance to encounter and conversion, this book draws us into the reign of God from the bottom up and leaves no doubt that more is yet to come." "I believe Keith’s book We Were Wrong, is one of the most important and urgently needed narratives of the Gospel of our time. As the Christian community dogmatically argues among themselves, a surrounding world in need of Jesus becomes more confused, concerned, and critical of the Christian faith. Keith’s own story and enlightening revelations of the Gospel provide the clarity and understanding so desperately needed by so many. I know I did." "My Father, Bob Pierce, always wanted to inspire others to step up to the plate and use their gifts to serve Christ without fear or apology. Pastor Keith Stewart has done just that with this book. Some people will find it hard to read. Others will find it hard to swallow. But I can guarantee that no one will read this book and shrug it off. My father was not afraid to make people feel uncomfortable… uncomfortable with the imbalance of suffering in the world… uncomfortable with their own inertia… uncomfortable with the status quo. Pastor Keith Stewart has that gift, too! People may not always appreciate you for making them uncomfortable, but when they get uncomfortable enough, they will move. And even the slightest movement towards compassion, generosity, and greater faith will change the world. Thank you for making us all a bit more uncomfortable! "One of the most important books to be written for the church in North America this century. We Were Wrong is written with a pastoral heart and a deep grounding in scripture. I was surprised over and over by biblical insights that were hiding in plain sight. I want to press this book into the hands of every pastor and Jesus-follower in the country." Pastor Keith Stewart has been happily married to his wife Brenda for 30 years, has two daughters and one granddaughter with whom he is smitten. Twenty-six years ago, Pastor Keith founded Springcreek in suburban Dallas, Texas. His church grew from a handful of people to 2500 who call Springcreek Church their home. Pastor Keith is a tireless advocate for the world's poor. He has done extensive work with World Vision including; teaching missional theology for Pastor Vision Trips, consulting, conference speaking, fundraising and writing. He currently serves as a member of World Vision's Ministry Advisors Council. He attended Welch College in Nashville, Tennessee and Dallas Theological Seminary in Dallas, Texas. In 2014, Pastor Keith was awarded the prestigious Bridge Builder Award by the Garland NAACP. Springcreek Church has deep roots in the community that include; the largest disability ministry in the State of Texas, recovery ministries, elder care, ministry to prior offenders, homeless ministries and significant local church and civic partnerships.